Hair transplantation is a surgical technique that involves transferring individual follicular grafts from a section of the scalp called the ‘donor site’ to a balding region of the body known as the ‘recipient site’. The reason why hair transplant technique is extremely successful is that the hair follicles are removed with their roots, which are resistant to DHT, the hormone that causes balding. When performed with precision, the resulting hair growth after the operation acts as natural hair. 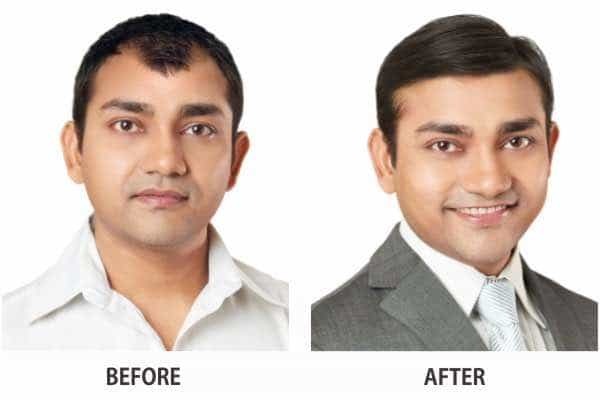 The ‘Aesthetic Hair Implants- AHI’ technique available at RichFeel’s Vile Parle clinic is an exceptional hair transplantation method, and can be done on both men and women irrespective of their age. Available at the RichFeel’s clinic in Vile Parle, the ‘Aesthetic Hair Implants- AHI’ is one technique wherein the specialist don’t make use of surgical strips or blades for the extraction process making it minimally invasive. Moreover, unlike traditional hair restoration methods, AHI does not require using surgical scalpels, thus making it a scar-free way of hair transplantation. The AHI technique is an award-winning hair loss solution for anyone who wishes to get a full head of healthy hair without any linear scarring. The cost of hair transplant depends upon the number of follicular grafts you wish to get implanted. Book an appointment at RichFeel’s Vile Parle clinic, and we will get in touch with you to determine the full cost of your treatment. To arrive at our Vile Parle clinic, the location is Shop No. 1, Ground Floor, Shree Mangal, Society, 167, S V Road, Vile Parle West. The nearest landmark to the Vile Parle RichFeel clinic is Anytime Fitness Gym. We are open seven days a week from 10AM-8PM. RichFeel has many centres in Mumbai, customers from locations such as Yamuna Nagar, Nehru Nagar, and LIC Colony visit the Vile Parle RichFeel centre. If you are travelling via bus, the closest bus stop is Vile Parle, and if you are taking the local train, then you can get down at the Vile Parle station. Customers can also take a taxi to reach the Vile Parle clinic.